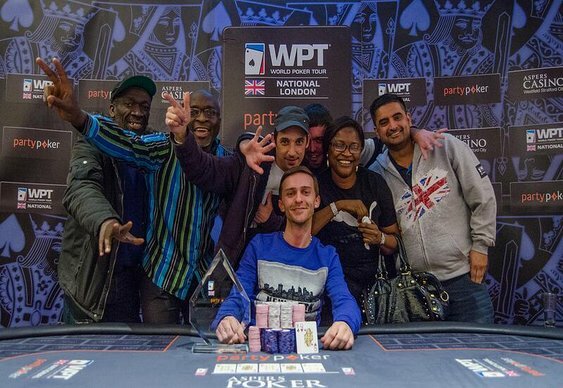 Laurence 'Riverman' Houghton claimed the latest WPT National title on Sunday after he overcame a tough field inside Aspers Casino. After kicking off late last week the accumulator event saw many of the UK's top pros join the action but when it came down to the final session it was Houghton who found form. Indeed, by the time James Mitchell (9th - £2,760) and Edjis Cergars (8th - £3,680) had fallen by the wayside, Houghton was sitting as one of the smallest stacks at the start of the final table. However, as Steve Owens (7th - £4,610) hit the rail Houghton was able to find a timely double up with A-A against Gareth Holt's Ac Kh. That pot edged him closer to the chip leaders and as Bobbie Brummitt (6th - £5,540), David Gassian (5th - £6,900), Chaz Chattha (4th - £9,300) and Gareth Holt (3rd - £12,500) all failed to keep hold of their stacks only Arvin Ravindran was able to stop the 'Rivermanl'. When heads-up play started Houghton had both the chip lead and the greater amount of experience, however, Ravindran wasn't put-off by his opponent and gradually worked on securing the advantage. A number of swings encapsulated the final battle but when the chips were down and the dust had settled Houghton was able to reclaim the lead and eventually took the WPT National title when his Kc Qh was able to outpace Ravindran's 7s 6c in the final showdown. With that Ravindran was sent into the shadows to collect his £19,400 consolation prize, while Houghton stood smiling in the spotlight with his £29,500 winner's prize. The next WPT National UK event takes place in Newcastle from 1-4 May. Qualifiers are up and running at PartyPoker.